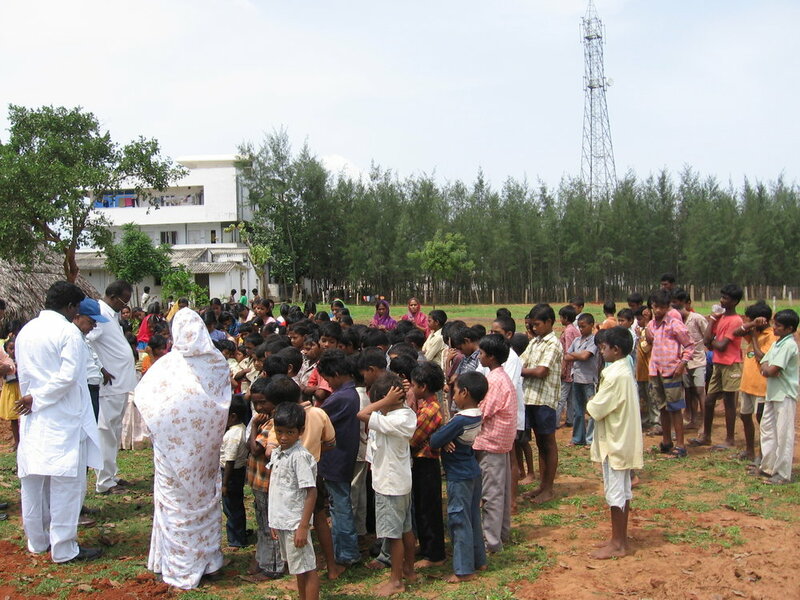 1996 - The Mekala family begins giving street children a home, as well as opening their doors to children who have been left with churches and other Non-profit organizations in Andhra Pradesh. 1997 - With their home in the middle of Vishakaptnam as the primary residence for 31 children and relying on no western support, the Mekala family purchases a property on the outskirts of town and build a small thatched roof building to house the children. 1998 - A small church building is built that can also house the children, and serve as a kitchen and bathroom area. 1999 - Additional land is purchased around the church building to increase the area of the campus to 3.70 acres. 2000 - Teams from the United States begin providing support through a non-profit setup to funnel funds to the Mekalas. Ground is broken to build a structure to house children. 2001 - The first building is completed with space to house 75 children, as well as classroom space for an additional 200 local village children to attend school at the campus. 2002 - The Two World’s School opens to area children and soon the school is at capacity. A second building begins construction that will expand the children’s home to include space for 200 children, and 600 school children. 2003 - The 2nd building is completed, and soon over 150 children are being housed, fed and clothed at the Two World’s Children’s Home and School. 2004 - 2007 Teams from North America continue to setup medical camps, Vacation Bible School weeks during school breaks, and assist in teaching English at the school. 2014 The election of Prime Minister Naredra Modi begins a shift in how the Two World’s Children’s Home can operate. In October the Cyclone ‘Hudhud’ devastates the campus, tearing off the roof, uprooting vegetation, and destroying the electrical wiring. The Mekalas work to move children to homes, churches and other non-profits as the campus is not inhabitable. 2015 Rebuilding begins on the campus from the devastation of the hurricane. 2009 - 2011 Western support dwindles almost completely, and the children’s home has to shut down the school operation. 2012 - 2013 The Mekalas are able to continue ministering to the 112 children at the campus by selling off land and using it to purchase food and basic needs. 2017 - We host many now grown children who were residents of the children's home who share their stories with us, and offer their thanks and support.